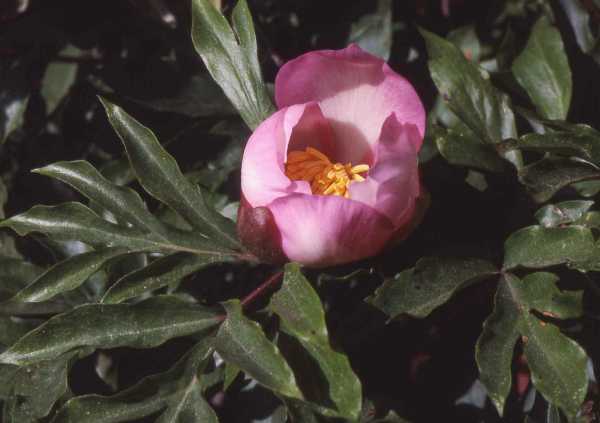 This member of the Peony family is endemic to Crete and Karpathos. It is becoming more difficult to find because they are so frequently picked, and are particularly popular as button-holes for weddings. The flowers vary in colour from almost pure white to dark pink, and like other peonies they are short-lived and open first to a cup-shape and then become wide open before dropping their petals. This plant blooms from late March to June - later in the mountains; it grows in field margins, on rocky slopes and in woodlands. The specimen shown above was photographed in Crete.